Wikipedia calls retail therapy: shopping with the primary purpose of improving the buyer's mood or disposition. Often seen in people during periods of depression or transition, it is normally a short-lived habit. 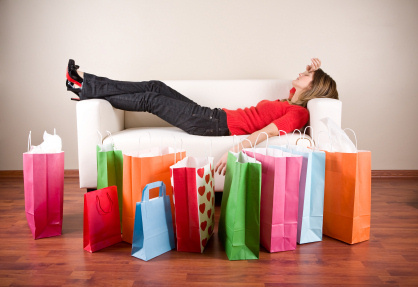 Items purchased during periods of retail therapy are sometimes referred to as "comfort buys". I was thinking deeper about the concept of retail therapy and I think I pinpointed something important. Often times the things that put us in a bad mood are instances where we don't feel valued. We don't feel we as people, our opinions or our wants/needs are valued in some way. Retail therapy is a way of showing OURSELVES that we value OURSELVES. It's a purchase that says, if no one else cares about me, I do. Even if that feeling is fleeting or not really accurate after the smoke clears, it's still the feeling I believe fuels retail therapy. I love a good retail therapy session, and while I wouldn't advocate for people to go off spending money they don't have, sometimes it's nice to show appreciation to yourself in the midst of feeling unappreciated. I don't normally enjoy shopping, but sometimes it does definitely feel nice to go and buy something new for yourself-especially when you can't exactly justify buying it. I never do go totally overboard (and never shop with credit cards) but there is definitely something to be said about retail therapy. @silverthoughts2 - there is definitely something to be said about it. I think as long as you keep within your means it can definitely be a good mood booster. I ask my husband what I'm supposed to do while he's away with the Army..he says, "Buy things. Fill the void." in a joking way. Unfortunately, that's usually what happens a least once every couple of months when he's gone :( I completely get what you're saying.